This is the god of Ken Ham and the creationists. He created the universe in 6 days 6000 years ago, and though that was an impressive feat, this god is guilty of grave deception. He planted evidence for no evident purpose other than to deceive humans, once they became sufficiently knowledgeable, into thinking that the universe is billions of years old. To this end, he manufactured trillions of fake fossils and strategically placed them in rock layers to make it look like a long period of evolution had occurred. He artificially aged radioactive elements, engineered the DNA of animals in a fashion to correlate perfectly with an apparent evolutionary descent, created ice cores and rock layers consistent with an old earth, and even created pre-made light beams stretching all the way to the earth from the distant stars to make it appear that they were millions or even billions of years old. And, of course, this same god was extremely cruel in drowning nearly every living thing in a fit of anger. This is the god of Ken Ham. This is the deceptive and cruel god. This is the god of mainstream or more liberal Christians who understand that biological evolution is true, but attempt to hold on to their theistic beliefs by declaring that god ‘guided’ the evolutionary process. This god is pathetically incompetent and wasteful, given that 99% of all of the animals he ‘directed’ to be made eventually became extinct. Although humans were his intended end goal, he ineptly allowed dinosaurs to dominate the earth for 160 million years, effecting shutting down any progress in reaching that goal. Even when he finally guided humans into existence, he came very close to having them go extinct at one point when only a few thousand remained alive. This is the god of scientifically-literate Christians. This is the incompetent god. This is the god of Christians who are scientifically literate but wish to forgo the logical issues involving the incompetent god described above. This god did not interfere with the evolutionary processes on the earth, and had only a passing interest in the planet. He had no end goal, but was just observing what was happening. Only after humans evolved to a point where they had languages and writing did he decide to intervene, though he did this in a haphazard and isolated fashion, revealing himself to just one small primitive tribe of people in a remote corner of the Middle East, while ignoring completely all of the other civilizations, many of which were much more advanced. Even when he decided to expand his revelation worldwide, he still limited this effort to the same isolated area, leaving the vast majority of people in the dark. Then after this period of revelation, he left the scene entirely for the next twenty centuries. This god is not that interested in the earth or in humans. This is the apathetic god. This is the god of the atheists; he exists only in the minds of believers. This is the god that seems to be consistent with every scientific measurement ever taken- given the total lack of evidence of interference by any supernatural agency. 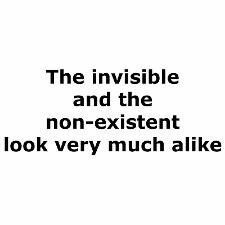 This is the non-existent god. So, the Christian god is either deceptive and cruel, incompetent, apathetic, or non-existent. Note that none of these gods merit a shred of worship. That’s right. There is no way to paint the god of Christianity in a favorable light. I’ve been lying to you. I’m not a Christian.